In another beautifully written children’s book of historical fiction, Whelan brings alive a foreign culture and foreign era, making us live and breathe with it. In this children’s book, we are brought to communist China after the cultural revolution. The rules and fears of the people are vividly expressed, as well as the ways in which common people tried to make the best of things. At the same time, we meet heroes, those who would not give up their principals no matter what the personal cost. This particular children’s book addresses the serious culture issue of preference for boy children during the restriction of two children in a family by the Communist party. The most intriguing part of a children’s book like this is how real the characters become. 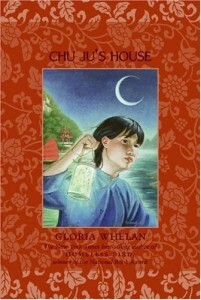 Each person that befriends Chu Ju when she leaves her home becomes a friend to the reader. Each risk that Chu Ju takes feels like a personal risk. And the outcome at the end of the story is every bit as satisfying as the journey itself. We watch a young girl transform from uncertainty to a strong young woman capable of sacrifice and kindness. Again, a terrific way to introduce children to other times and places in history. Best for 10 and up, but sufficiently well-written to hold the attention of older children as well. Other children’s books by Whelan include The Impossible Journey, and Angel on the Square, both set in Russia.